Do I Need Snow Guards for Solar Panels? Ever experienced a solar panel avalanche? Then read on to find out if you need snow guards for solar panels. Although people living in warmer climates would never consider how snow could impact their solar experience and even ask the question if they need snow guards for solar panels, those residing in the northern regions of the US must always consider their weather when it comes to anything exposed to the elements. Failure to take mother nature into consideration often has dire consequences and how you handle your solar installation is no different. Naturally, your panels won’t be producing much electricity if they are covered in snow, but buildup on the panels can cause real danger in certain situations. If you are reading this because you have heard of a solar panel avalanche or seen one firsthand and you have the safety of your family and landscaping to consider, then it is certainly worth investigating the possibility of needing solar panel snow guards. Why Would I Need Snow Guards for Solar Panels? The issues regarding snow and solar panels revolve around the materials used in the manufacture of the panels themselves. Most panels have a top layer of glass or plastic to keep the panels durable while still allowing the maximum amount of electricity-producing light to reach the solar film. This material is also easy to clean and allows for small chips and cracks to be repaired without much trouble. One issue that the glass creates, however, shows up when lots of snow starts to pile up on the surface. Just like metal roofs, the solar panel’s glass surface creates scant friction between the roof and the snow, and it is very common for the snow to come off all at once and create a mini avalanche like the one below. Now, don’t freak out and start removing your panels just yet! Remember that this is only a concern during major snow storms that cause lots of accumulation in a short amount of time and your panels are over a high traffic area. Typically, light snow will just melt or fall off of the panels in short order as the panels heat up from the sun and heat coming from the home. But if you have frequent, high-volume snowstorms and your panels are right over where you park the family mini-van, you might want to look into the possibility of circumventing these issues to avoid the very real threat of damage to your family and personal property. Remember that preventing snow accumulation on solar panels can start during the planning phase. If you live in snow country and expect to encounter snowfall like this regularly, it would be prudent to consider the angle that you use for your system or even your roof if you are building a new house with a solar system attached. If the weight of the snow isn’t a concern when considering your roof construction and panel durability, then you could use a relatively flat roof and panel angle to try to keep the snow in place while it melts naturally. On the other end of the spectrum, having a roof and solar array at a steep angle could prevent snow from accumulating in the first place. It would be worth having a conversation with your builder and solar installation professional to determine what is best for your particular situation. Snow Guard Basics: How do They Work? Even though we are talking about solar panels specifically for our purposes today, snow guards have been around for quite a while in one shape or another to help prevent snow sliding off of standard roofs. Snow guards come in many different shapes, sizes, and application strategies, but the basic idea is that you will attach a system of blocks that will either hold the snow in place while it melts naturally or causes it to drop off the roof in smaller batches. Either way, you will avoid the sudden “avalanche effect” that can happen with no prevention in place. One of the bigger names in snow guards, Alpine SnowGuards, shows how some of their products attach to the rooftop solar panels in their video below. Costs vary between manufacturers and models. Manufacturers typically require you to contact them for a cost estimate as each installation is different in size, shape, and ‘danger zones’. However, as you only need to install snow guards in potentially dangerous areas – not covering the entire solar installation – and ‘non-solar’ snow guards typically cost around $5 each (though of course you’d need to install more than just one to safely control the snow), costs should be fairly minimal when compared against high hospital bills or even just a frustrating (and cold and wet) walk out the door on your way to work. While financial savings certainly plays into the decision to purchase snow guards, keep in mind they’re main function isn’t cost-effectiveness (you’re not going to increase your production by installing snow guards). They’re main function is your family’s safety and well-being. And it’s hard to put a price on that. Regardless of your current roof and solar setup, it is often relatively easy to set up a system of snow guards to help prevent sudden drops of snow from your roof. Installation is where snow guards for solar panels start to deviate from their roof-only counterparts. With roof-only snow guards, installers try to place blocks in places where the snow would typically travel such as valleys and seams. They will also usually install them in a particular pattern that helps to control ice movement better than a stationary rail. Solar snow guard installations work a bit differently, but the ideas are mostly the same: disrupt falling ice or prevent it from moving. If you live in areas with heavy snow, it’s likely that your solar installer has some experience with installing snow guards, could assist with the installation, or at least provide some insight and recommendations. As seen in the video above, the guards are usually installed either onto the panels themselves with a clamp or in between the panels using the frame. When discussing these snow guard options with your solar installer, it would be prudent beforehand to also to consider the overall impact that snow can have on your levels of production. If you are leasing the panels and are guaranteed a certain amount of electricity in a year or your money back, then it might not matter to you – you’ll be saving money even if your panels aren’t producing. If you own your system, however, it is important to learn all you can about how much of a drop in electricity you should anticipate from snow accumulation in general. Do your homework and make sure that you are getting a quality operation that knows what they are doing and cares about their customers. 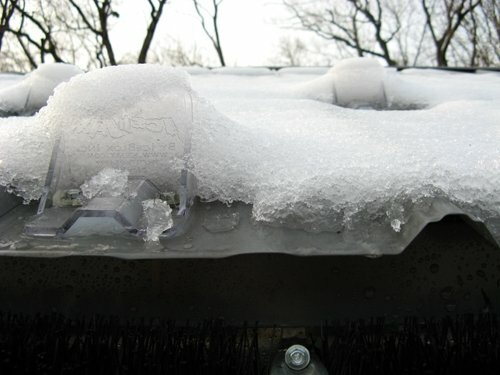 Be sure to ask your installer how snow guards would affect the snow melting on your roof. Would the snow only last for an extra day or two after you install snow guards, or for a whole week? How this snow covers affects your electricity production (and therefore financial savings) depends on how much snow your area receives each winter (both frequency and how much typically dumps in one storm). In Denver, Colorado, where weather changes quickly and snow usually melts in a day or two, the effect of snow guards on your electricity production would probably be minimal. But in more northern states where snow sticks around for weeks or months, it could seriously hinder your production, so be sure to pick your installers brain on if installing solar guards is a good idea for your situation! If your system is already in place and it is inconvenient or cost-prohibitive to bring your original solar installer back to install your snow guards, then looking into local roofers might be a more economical option. Since the system is already there, they won’t be responsible for any technical work with your panels, but it would still be a good idea to vet your local options to see who has some experience with doing this type of work. There is no reason to skip this easy, information-gathering part of the process and allow someone to potentially cause thousands of dollars worth of damage. At the end of the day, snow guards are relatively straightforward to install once you have the correct hardware for your application, but there are still many dangers present when working on a roof. Only go this route if you have experience working in this environment and be sure to use any and all precaution while on the roof such as special shoes, proper ladders, a safety harness, and a helper present in the case of an emergency. Never work on your panels with snow already on the roof or while the roof is wet from the rain. Under such conditions, the roof could be extremely slippery. Safety is the number one priority for any home because it is protecting our most treasured possessions: our family. If you have concerns that your solar system could be a threat to that safety, then it would make sense to at least explore your options for preventing snow avalanches on your roof. Because this is an issue of safety, do not be afraid to reach out to professionals to ensure that you are using the right parts for the job and that they are installed correctly. Professional installation will often also come with some warranty protection that could pay dividends in case something goes wrong. 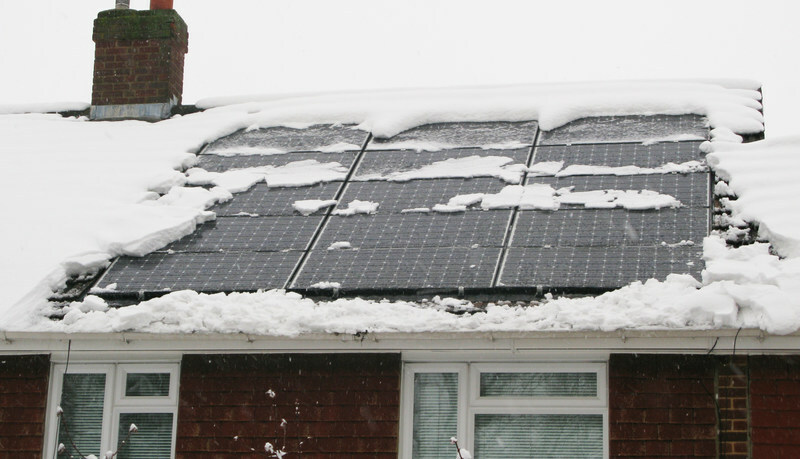 What is your experience with snow on your solar panels? Have you used snow guards? Is there a better route to take? Let us know in the comments!